Improve your acceleration and you will improve your results in the 100 meter sprint. Getting out of the blocks and to maximum velocity quickly is the key to the 100 meters. In the clip below Coach Marc Mangiacotti, assistant coach at Harvard University, shares a simple test to measure your athlete’s acceleration. Coach Mangiacotti coached eight NCAA National Champions, 53 all-americans and, 31 school record performances while at DIII Wheaton College. He was the 2008 USTFCCCA Division III National and Regional Women’s Assistant Coach of the Year and is a USATF Level II Certified Coach in sprints, hurdles, relays, jumps, and combined events. Coach Mangiatti calls his acceleration test the 10 Step Test. In the 10 Step Test he simply measures how far down the track and athlete can move his/her hips in their first 10 perfect acceleration strides. He uses this as way to measure their training progress. he notes that it is important to not compare athletes to each other. You should compare only each athlete distances to their prior testing measurements. 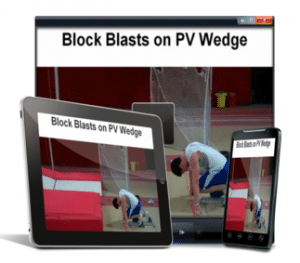 It is also critical to disregard tests in which the athlete breaks “form” and is not using proper block or acceleration mechanics. Do allow the athletes to reach or bound. Any breakdown of perfect mechanics calls for a re-test. it is important to be picky in this area. Only perfect mechanics count. The YouTube video below is from Complete Track and Field where you can find many great track and field coaching tools,. The video has audio, so please make sure you sound is turned on. Click the arrow to play. Note that some schools block access to YouTube.